A gold Iron Age quarter stater of Cunobelin (AD 8-41), attributed to the Catuvellauni and Trinovantes. Cunobelinus 'plastic' type, Dating to the period c. AD 8-41. Obverse: corn ear without central stalk, CA to left, MV to right. Reverse: horse rearing right, dashes for mane, branch and pellets above, CVN below. ABC no, 2816, BMC no. 1846-1848, VA 2015. 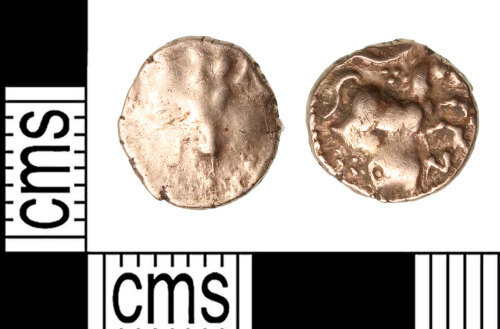 Striking of this coin seems to have been weak, with the obverse and elements of the reverse poorly defined. Measurements: 10.88mm in diameter, 2.33mm thick and 1.36g in weight.